Robert Earl Wertz, age 56, passed away on March 29, 2019 in Mesa, Arizona. Robert was born on October 10, 1962 in Phoenix, Arizona. He is survived by his wife, Margaret Wertz; his children, Christopher, Jacob, Joshua, Justin, and Nathaniel; and his grandchild, Hazel. A funeral service will be held at 2:00pm on Wednesday, April 10, 2019 at A Wise Choice – Desert View Chapel, 9702 East Apache Trail, Mesa, Arizona 85207. 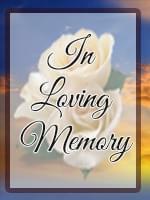 A visitation will be held on the same day and at the same location, from 11:00am to 1:00pm.